The very word “termination” is enough to send shivers down our back, because it is every employee’s worst nightmare! However, while this term is usually used to denote the termination of an employee from a particular organization, it can be used to describe other things as well. For example, the termination of a tenant by the landlord is quite common, and is no less devastating. To soften the blow, and to part on amiable terms is a must in each case, and that is why a Termination Letter is a must. While there are different types of termination letters, the nature and purpose of these remain the same.Have you been avoiding handing over a termination letter, because you do not quite know how to face the person? Well, the most professional thing to do would be come up with a detailed termination letter stating all the relevant facts. To do that, you can always seek the help of free Termination Letter Templates found online. Given the fact that there are different types of terminations, these are the following types of termination letters found- 1. Voluntary terminations- In this kind, the employee willingly terminates his employment. 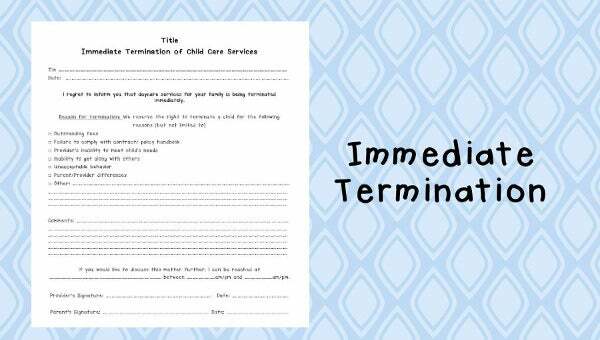 There are special downloadable termination letter templates available for this. 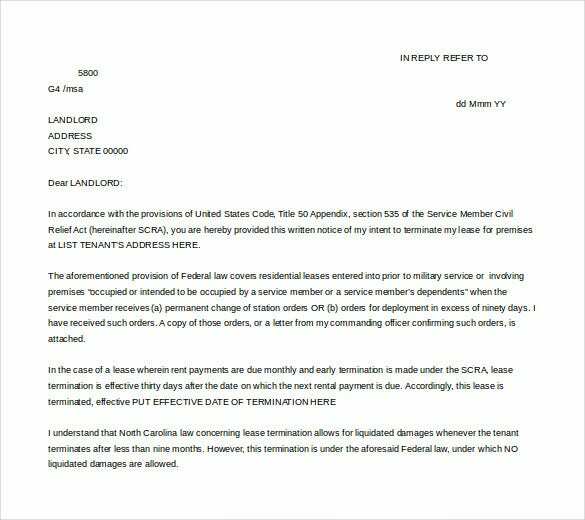 You may also see tenancy termination letters. 2. 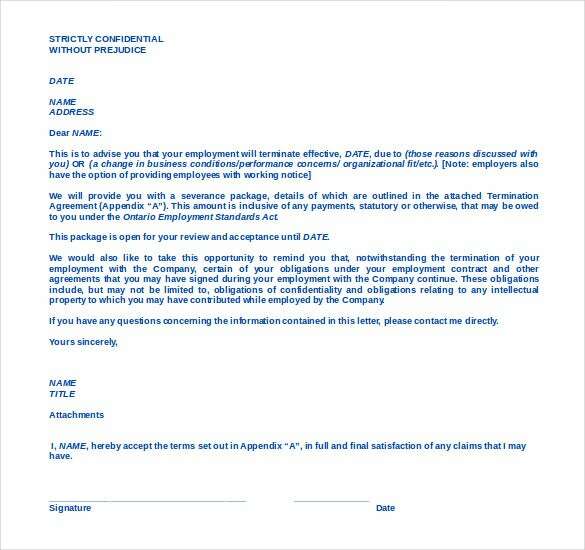 Involuntary terminations- In this kind, a letter is of the utmost importance. An employee may be terminated for his wrong acts, disobedience, absenteeism et cetera. In fact, he may be terminated due to cut offs as well. Whatever the case may be, termination letter templates in word can help you out. You may also see best termination letters. > Why Use Termination Letter Templates? 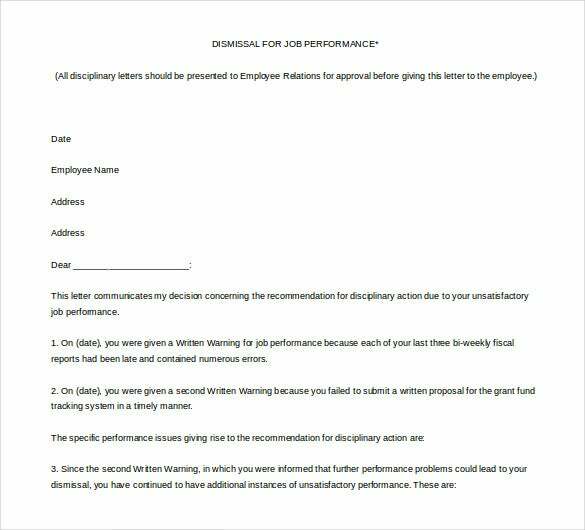 Writing a termination letter is no matter of joke, and if you think it’s going to be easy, then you’re grossly mistaken. It is always better to seek professional help when it comes to letter like this. 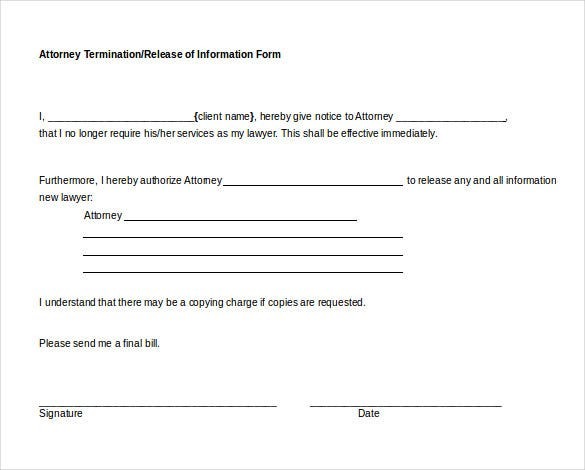 With the internet at your fingertips, you can always look up some termination letter templates. It would certainly make your job much easier for you, since all you have to do is hit the download button. 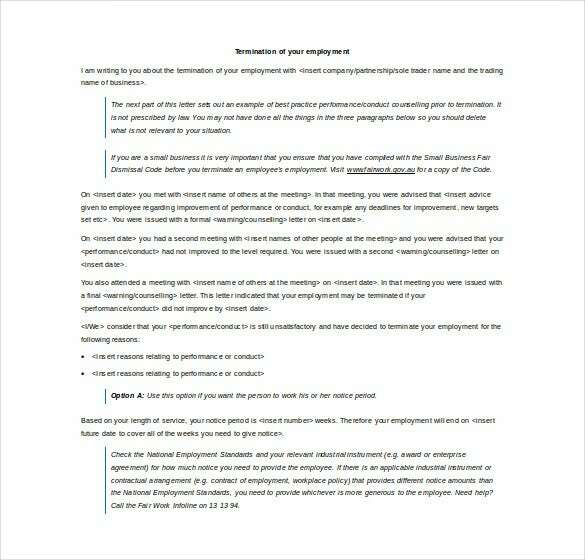 The termination letter templates on Microsoft Word are well designed and effective. 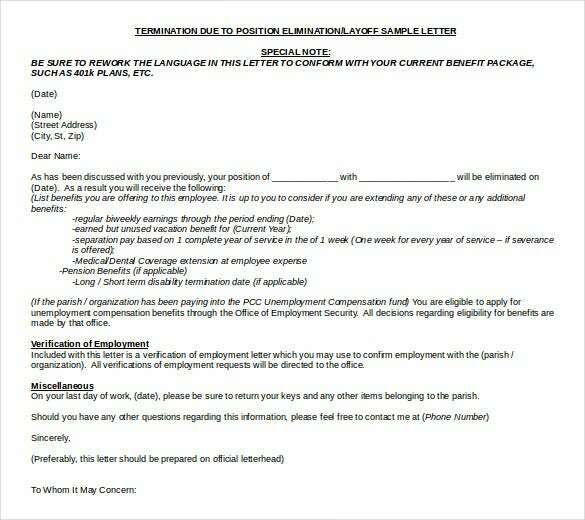 What could be better than a well designed termination letter that is easy to edit? 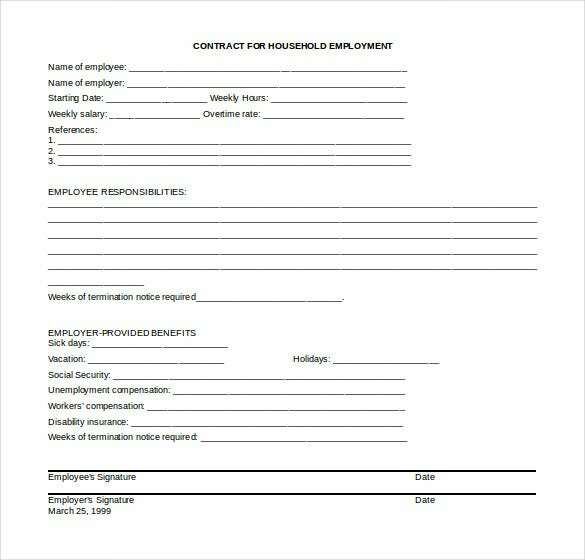 > How to Write Termination Letters? While creating your termination letter, or writing one of your own, you can keep these in mind- 1. The language you use must be professional and easy to understand. That is why the Free Word Templates are commonly used. 2. Phraseology is important. Do not use confusing phrases which might lead to confusion later on. Take the help of termination letter templates in ms word to avoid silly mistakes. 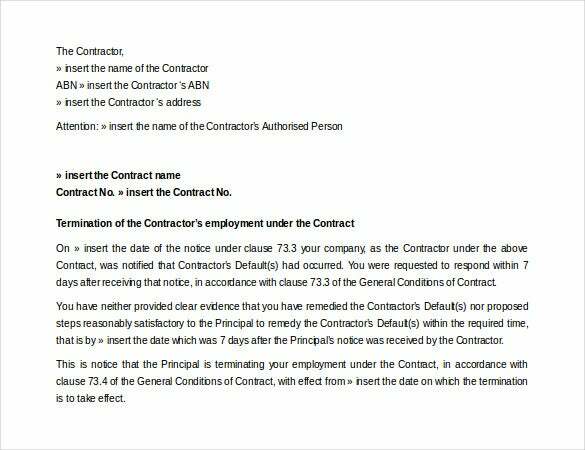 You may also see contract termination letters. 3. You must state the reasons for termination clearly if you want to avoid any legal issues in the long run. 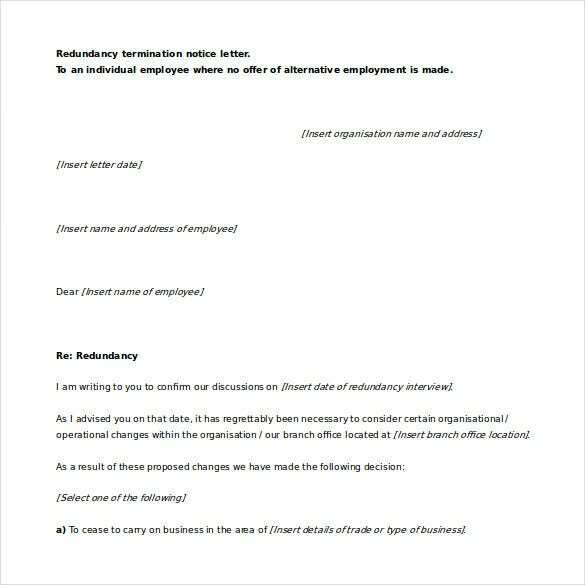 Efficient termination letter templates might come in handy! 4. If you are choosing a termination letter word file, go through it thoroughly before downloading it. 5. Keep the letter simple and precise. There is no point in beating about the bush. Convey your message in a clear manner with the help of amazing termination letter templates. You may also see company termination letters. 6. While writing the termination letter, keep in mind the purpose. The kind of letter termination for word you choose will depend on this factor. 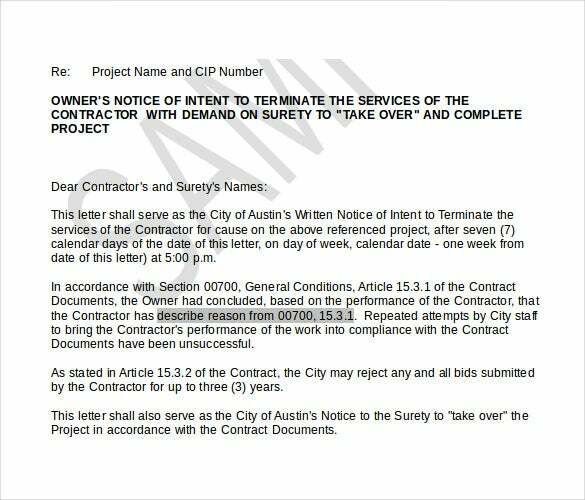 You may also see lease termination letters.